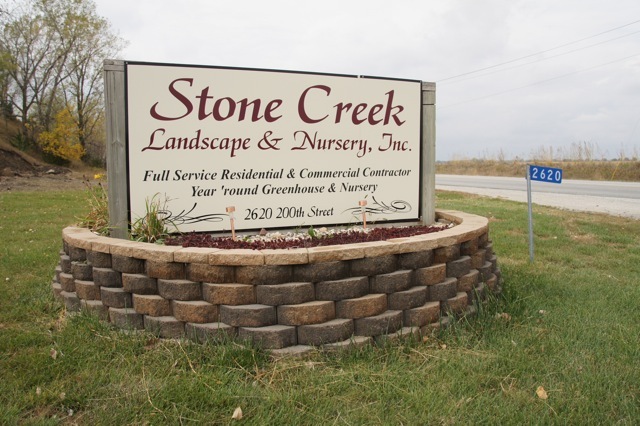 Stone Creek Landscape & Nursery is an award-winning company established in 2005. We are one of the major landscape contractors and greenhouse/nursery companies in the Fort Dodge, Iowa area as well as in Iowa. 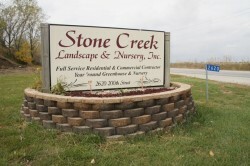 Stone Creek is engaged in all segments of the landscape industry including: landscape installation & construction, landscape design, erosion control, seeding sodding, hydro mulch, irrigation, landscape lighting, fencing & plant material. Stone Creek has large retail garden center/nursery with a large variety of B & B Trees, Container Trees, Shrubs, & Perennials. We offer metal iron décor and maintenance-free outdoor furniture and other unique garden center items. We pride ourselves in the fact that what we sell is USA made. Our retail store is open to the public. We pride ourselves on our quality, education and experienced professional work. Our highly-trained staff is continually learning to provide you the best information possible. Stone Creek is dedicated to meeting and exceeding our customers goals and expectations with the highest quality production and services produced in the timeliest fashion, by the finest professionals.